Head coach Johann van Graan has named his Munster team for this Sunday’s Guinness PRO14 clash against the Cheetahs at Toyota Stadium. Tyler Bleyendaal captains the side from inside centre with Bill Johnston and Fineen Wycherley making their first starts in the Guinness PRO14. There are nine changes to the starting XV that secured a last-gasp win over Glasgow in Limerick last weekend with three Academy players in the matchday squad. Four changes to the backline see Shane Daly, Alex Wootton, Bleyendaal and Johnston all come into the side. Mike Haley continues at fullback as Academy player Daly comes in on the right wing with Alex Wootton, a try-scoring replacement in the win over Glasgow, on the opposite flank. 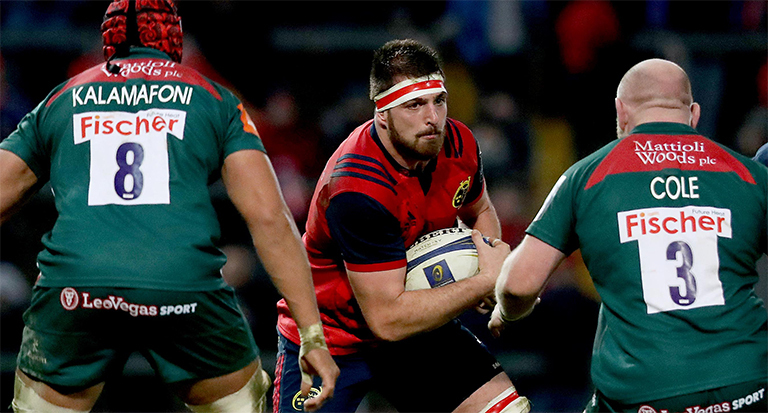 Bleyendaal makes his 40th appearance for Munster and features in the PRO14 for the first time since February with Sammy Arnold completing the centre partnership. Alby Mathewson and Johnston combine in the half-backs. The five changes to the pack see Kevin O’Byrne, Stephen Archer, Darren O’Shea, Wycherley and Arno Botha all included. James Cronin joins O’Byrne and Archer in the front row with Jean Kleyn partnering O’Shea in the second row. Wycherley and Botha are joined by Chris Cloete in the back row. Academy players Sean O’Connor and Gavin Coombes are named among the replacements.